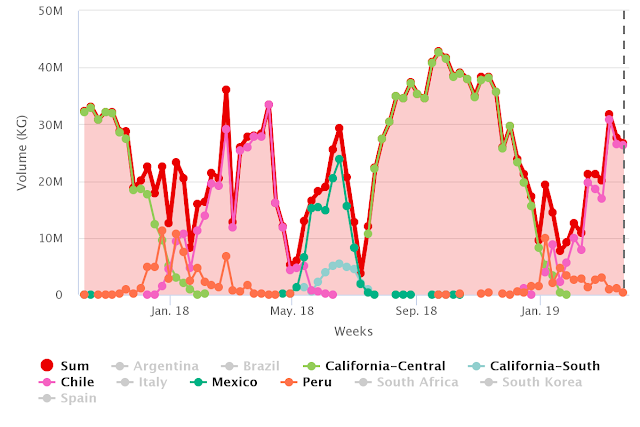 A rapid glance at the chart below illustrates how U.S. shipments for table grapes - of all varieties - are essentially made up by five origins: Chile, Mexico, Peru, and California (Central + Southern). Each of which essentially drives the bulk of supply during their respective seasons. 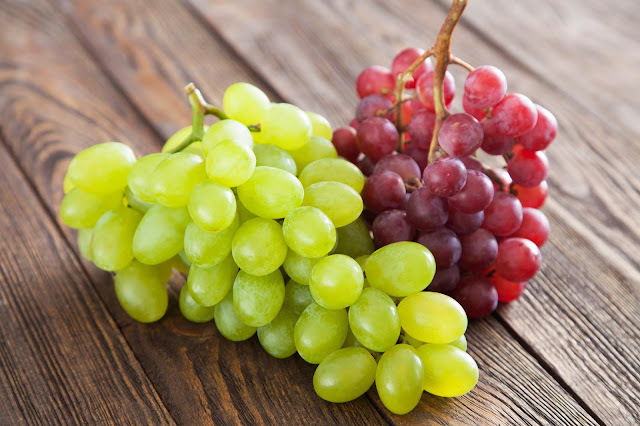 A dive into 2018 data reveals that Chile was the top foreign supplier of grapes to the U.S., accounting for roughly 64.6% of total import volume. In second place we see Mexico with 25.2%, followed distantly in third by Peru at 9.3%. 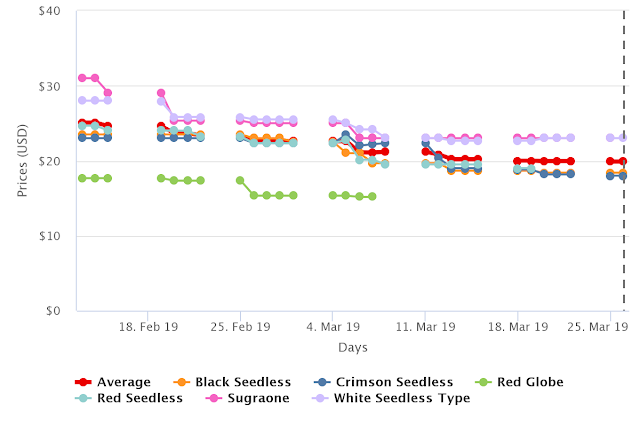 Today, we find ourselves at a point where Chile’s season is going to significantly wind down, and Mexico’s harvests will soon start hitting the markets. The issue is how significant will this time gap be? 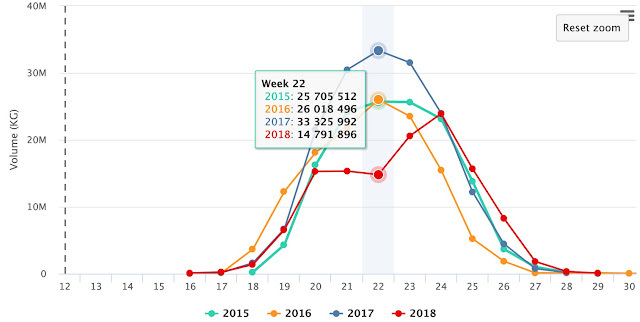 As explained in detail on last week’s FreshFruitPortal.com article entitled “Massive Mexican table grape crop on the cards”, expected shipments are said to be on track to approach 2017’s figures. This is attributed in some measure to the grape producers’ association of Mexican State of Sonora (bordering Arizona), which during its first-ever summit hosted in the U.S. spoke some eyebrow-raising volumes. 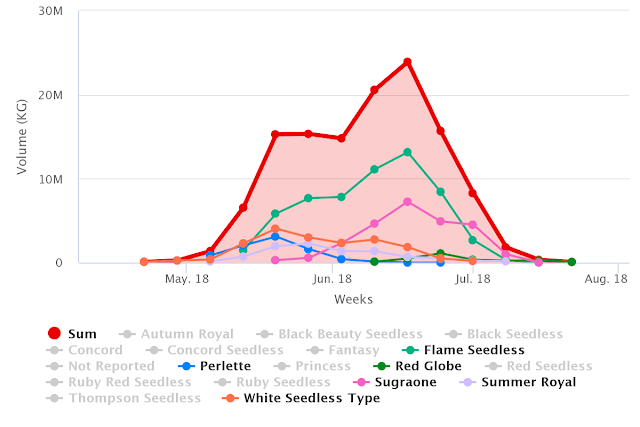 BLACK: Summer Royal | RED: Red Globe, Flame Seedless | WHITE: White Seedless, Sugarone, Perlette. 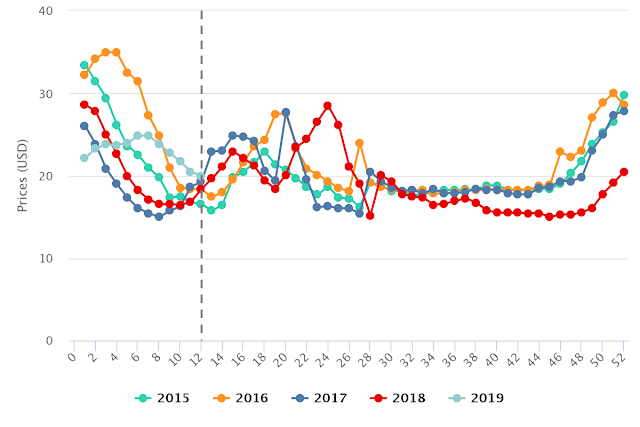 Over the past 6 weeks, price behavior indicate a slight downward trend, whereby average prices slid from US$23.82 down to US$19.97, as Chilean shipments increased from 21.33M to 26.75M for this time period.